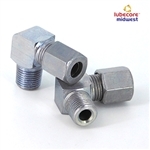 Elbow 90 compression 6mmOD-M6x1 steel 100 bar..
Elbow 90 compression 6mmOD-M8x1 steel 100 bar..
Elbow 90 compression 6mmOD-M8x1.25 steel 100 bar..
Elbow 90 compression 6mmOD-M10x1 steel 100 bar.. Some elbow fittings in enclosed table may not be in stock. Please inquire with our sales department on availability, include with your request a quantity and delivery date.. We can then quote you direct. 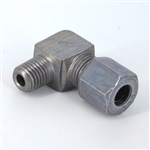 Any steel / Zink Nickel 6mm tube OD compression fittings can be converted using a 20211 – “6 to 5 mm” brass conversion olive / ferrule and utilized for plastic/nylon 5mm OD tubing.